Voice Activity Detectors (VAD) are used in numerous areas of speech signal processing. VADs are used in echo cancellers, noise reduction algorithms, and speech coders. In this article we will give a brief summary of the role VADs plays in each of these applications. In echo cancellers, VADs help to control the stepsize value of an adaptive filter, and help decide if residual echo suppression (or non-linear processing (NLP)) needs to be applied. A VAD is the particularly important in situations where excitation signal has a high noise floor. The noise signal can be strong to adapt an echo canceller, but not strong enough to accurately adapt the filter to impulse response of the system. This will cause the system to drift. An echo canceller should only train when there is certain amount of signal energy in excitation signal above the noise floor. 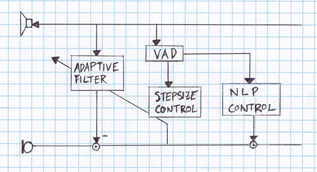 In other words, adaptation should be frozen when the VAD is not triggered. For the NLP, when the double-talk detector determines there is no double-talk, but excitation VAD is true, then the remaining signal in the error is residual echo and should be suppressed. In noise reduction algorithms, VADs are used during the noise spectrum estimation process. Minimum statistics is a technique commonly use for noise spectrum estimation because it allows for the continuous estimation even during periods of speech. However, when you know speech is not active, the noise spectrum can be quickly updated to improve estimation accuracy. In speech coders, to help lower the bandwidth requirement, they implement what is called discontinuous transmission (DTX) and transmit silence indicator packets (SID). When a VAD is active, standard speech packets are sent, but when a VAD is not active and there is only silence, then typically, a SID frame is sent to inform the other side that there is only silence and transmission of packets will be stopped.